I was taking a walk around the yard with my little grandson when we stopped in front of the brunfelsia bush. "Smell the flowers, Atom," I said, as we leaned in to take a whiff. Brunfelsia, better known as the Yesterday, Today and Tomorrow plant, has fragrant white, pink and purple blooms. I was admiring the plant's beautiful display and trying to pass along my enthusiasm for all things floral to my 8-month-old grandchild when a hummingbird moth suddenly caught my attention. "Look at that, Atom. Do you see the moth? He likes the flowers too." Hummingbird moths are fascinating creatures. 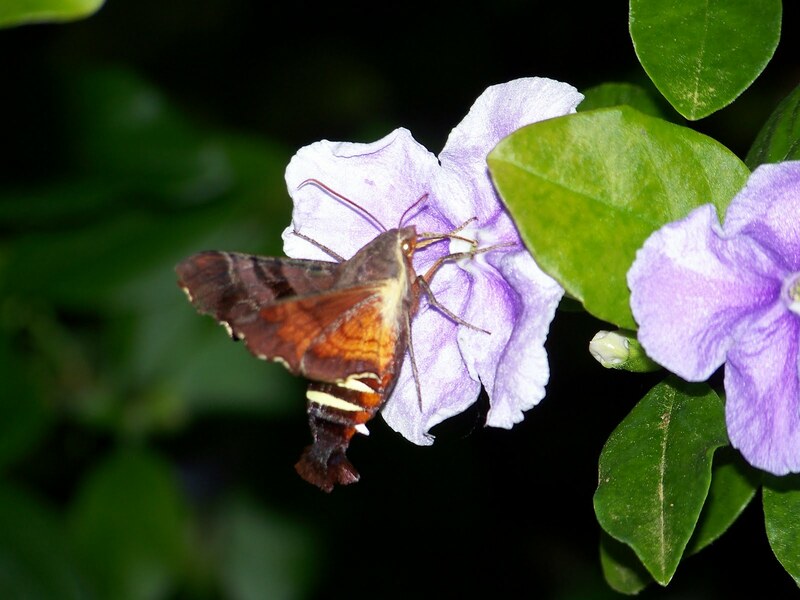 A member of the Sphinx family of moths, Hemaris thysbe (or common clearwing, as it is often called) is frequently mistaken for the small bird it is named after. Like many people, I had no idea what it was the first time I saw one. Although it looked like a hummingbird, somehow it didn't. It's easy to get confused. Hummingbirds and hummingbird moths are of similar size, weighing in at around 3 grams — about as much as penny. Bird and moth each seek out nectar-producing plants and feed in a similar fashion. They hover over flower heads while sipping nectar through thin, long, strawlike tubes. Although most types of moths appear only at night, hummingbird moths are diurnal. That means they are active during daylight — the same time that their lookalike namesake is active — as well as in the evening. Atom and I watched the tiny nectar sipper flit from one brunfelsia flower to another. Within seconds, the tiny flier moved around the flower-bedecked shrub, sampling the wares and absorbing nectar through its proboscis. As we stood there, a second moth swept in, and the two moths continued encircling the shrub, pausing frequently for sweet sips. Florida is not the only place where hummingbird moths live. They range throughout the United States and Canada, living as far north as Alaska and the Northwest Territories and as far south as Florida and Texas. Because their survival depends on a steady supply of nectar, they frequent yards that have flowers with strong, sweet fragrances and pale colors. They are especially fond of bloomers such as honeysuckle, viburnum, blueberry, thistle, vetch, beebalm, phlox, milkweed and blackberry as well as the light purple to white blooms of brunfelsia. As they zip from one bloom to another, brushing against plant anthers in the process, hummingbird moths inadvertently act as pollinators. Their fuzzy bodies attract dusty pollen like magnets. Once gathered, the pollen rubs off on the next bloom the moth visits. At less than a year old, my grandson understandably lost interest in the fuzzy moths long before I did. While I was willing to watch this unexpected glimpse into the world of tiny fliers and fragrant blooms indefinitely, Atom was becoming more and more ready for his afternoon nap. Of course, his needs took precedence. We left behind the moths and blooms to venture inside for a bottle of formula and a nice cuddle. As a grandparent, I see it as my duty to not only love my grandchildren but to teach them to love and respect the many wonders of nature that surround us all. The interaction with the hummingbird moth was only one of what I hope will be many encounters with nature's fascinating creatures. There's so much splendor right outside our doorsteps. Whether you live on large acreage, as we do, or in a city apartment, nature's bounty surrounds us all. The key to finding these treasures is the ability to look at the minutiae of life and to savor the moment. Like the flower that blooms in our yard, Yesterday, Today and Tomorrow, there are pleasures to be found with every passing day.